The RP Photonics Buyer's Guide contains 4 suppliers for optical resonators. The software RP Resonator is a particularly flexible tool for analyzing and optimizing optical resonators. For example, it can be used to calculate and minimize the alignment sensitivity of laser resonators. An optical resonator (or resonant optical cavity) is an arrangement of optical components which allows a beam of light to circulate in a closed path. Such resonators can be made in very different forms. An optical resonator can be made from bulk optical components, as shown in Figure 1, or as a waveguide resonator, where the light is guided rather than sent through free space. Bulk-optical resonators are used for solid-state bulk lasers, for example. Their transverse mode properties depend on the overall setup (including the length of air spaces), and mode sizes can vary significantly along the resonator. In some cases, the mode properties are also significantly influenced by effects such as thermal lensing. Waveguide resonators are often made with optical fibers (e.g. 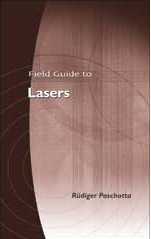 for fiber lasers) or in the form of integrated optics. The transverse mode properties (see below) are determined by the local properties of the waveguide. There are also mixed types of resonators, containing both waveguides and parts with free-space optical propagation. Such resonators are used e.g. in some fiber lasers, where bulk-optical components need to be inserted into the laser resonator. 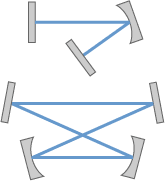 Figure 1: A simple linear optical resonator with a curved folding mirror (top) and a four-mirror bow-tie ring resonator (bottom). Linear (or standing-wave) resonators (Figure 1, top) are made such that the light bounces back and forth between two end mirrors. For continuously circulating light, there are always counterpropagating waves, which interfere with each other to form a standing-wave pattern. In ring resonators (Figure 1, bottom), light can circulate in two different directions (see also: ring lasers). A ring resonator has no end mirrors. In either case, a resonator may contain additional optical elements which are passed in each round trip. For example, a laser resonator contains a gain medium which can compensate the resonator losses in each round trip of the light. During a resonator round trip, light experiences various physical effects which change its spatial distribution: diffraction, focusing or defocusing effects of optical elements (sometimes involving optical nonlinearities), in special cases also gain guiding, saturable absorption, etc. In a ring resonator, light can circulate in two different directions. If there is an output coupler mirror, this leads to two different output beams. A linear resonator with the output coupler at an end does not exhibit this phenomenon. An optical component within a resonator is hit by the light once per round trip in the case of a ring laser, and twice per round trip in a linear resonator (except for the end mirrors). When light is injected into a linear resonator via a partially transparent mirror, reflected light can propagate back to the light source. This is not the case for a ring resonator. Therefore, ring resonators are sometimes preferred for resonant frequency doubling with a laser source which is sensitive against optical feedback. The non-normal incidence of light on every resonator mirror of a ring resonator causes astigmatism if a resonator mirror has a curved surface. A bow-tie ring resonator geometry is often used to minimize astigmatism by keeping the incidence angles small. Monolithic ring resonators with high Q factor can exploit total internal reflection at all surfaces, and thus may not require any dielectric mirror. Stability of a bulk-optical resonator essentially means that any ray injected into the system with some initial transverse offset position and angle will stay within the system during many round trips. For unstable resonators, there are rays which exhibit an unlimited increase in transverse offset, so that they will leave the optical system. The stability of a resonator depends on the properties and arrangement of the optical components, basically the curvature of reflecting surfaces, other focusing effects, and the distances between the components. When a parameter such as an arm length or the dioptric power of focusing element in the resonator is varied, the resonator may go through one (for ring resonators) or two (for standing-wave resonators) stability zones . At the edges of such stability zones, the beam sizes at the resonator ends can diverge or go toward zero, and the alignment sensitivity may also diverge. Most solid-state bulk lasers are based on stable resonators, but unstable resonators have advantages in certain lasers, particularly those with very high output power and high laser gain, where a better beam quality may be achieved. The modes of unstable resonators have rather complicated properties. Output coupling is often done with a highly reflecting mirror where part of the circulating light is lost around the edges (or possibly only on one side). Another possibility is to use a partially transmissive output coupler mirror with a transverse variation of reflectivity (Gaussian reflectivity mirrors). Resonator modes are essentially self-consistent field distributions of light – more precisely, electric field distributions which are self-reproducing (apart from a possible loss of power) in each resonator round trip. In waveguide resonators, the transverse mode structure is determined by the waveguide properties only, and is constant everywhere in the resonator, if the waveguide properties are constant. Only a single transverse mode shape may exist, e.g. if single-mode fibers are used. In bulk-optical resonators, the mode properties depend on the overall optical setup, and differ very much between stable and unstable resonators (see above). For stable resonators, the transverse mode patterns can be described e.g. with Hermite–Gaussian functions. The lowest-order mode (axial mode, fundamental mode) has the simplest profile; more complicated shapes correspond to higher-order modes. The mode properties can be calculated using an ABCD matrix algorithm. Unstable resonators exhibit a much more complicated mode structure, which can be calculated only with numerical means. Generally, the transverse mode size varies along the resonator axis. For each of the transverse mode patterns, there are only certain optical frequencies for which the optical phase is self-consistently reproduced after each round trip (i.e. the round-trip phase shift is an integer multiple of 2π). These are called the mode frequencies or resonance frequencies and are approximately equidistant (but not exactly equidistant due to chromatic dispersion). The frequency spacing of the resonator modes, also called free spectral range (FSR), is the inverse round-trip time, or more precisely the inverse round-trip group delay. This means that the FSR becomes smaller as the resonator length is increased. The ratio of the frequency spacing to the width of the resonances (resonator bandwidth) is called the finesse and is determined by the power losses per resonator round trip. A related measure is the Q factor, which is the ratio of resonance frequency and bandwidth. The article on resonator modes gives more details. If e.g. an end mirror is partially transparent, light can be fed into the resonator from outside. The highest internal optical power (and the maximum transmission through a resonator) can be achieved when the (monochromatic) input light has a frequency matching that of one of the modes, and the spatial shapes are also matched (→ mode matching). Particularly for low-loss resonators, the circulating intracavity power can then greatly exceed the input power by means of resonant enhancement (→ enhancement cavities). Resonant enhancement is also possible for a regular train of light pulses, when the frequencies of the pulse train match the optical resonances. In the time domain, this means that the pulse period matches the resonator's round-trip time, or an integer fraction of it. The modes of a resonator with a transverse variation of optical gain or loss in general do not form an orthogonal set of functions. These non-normal modes have some peculiar properties. For example, the total power in a superposition of such modes is not simply the sum of the power in the different modes. Under some conditions, resonators with nonnormal modes can be treated with complex Gaussian beam analysis, where e.g. the elements of the ABCD matrix and the Gaussian beam radius can be complex numbers. In situations with general astigmatism (such as in some nonplanar ring laser resonators), there are interesting effects such as image rotation, polarization rotation, and so-called twisted beams. There are technically interesting methods (often of numerical nature) for designing a resonator with given properties. The design of a laser resonator has important influences on various aspects of laser operation, e.g. on the alignment sensitivity and the beam quality.